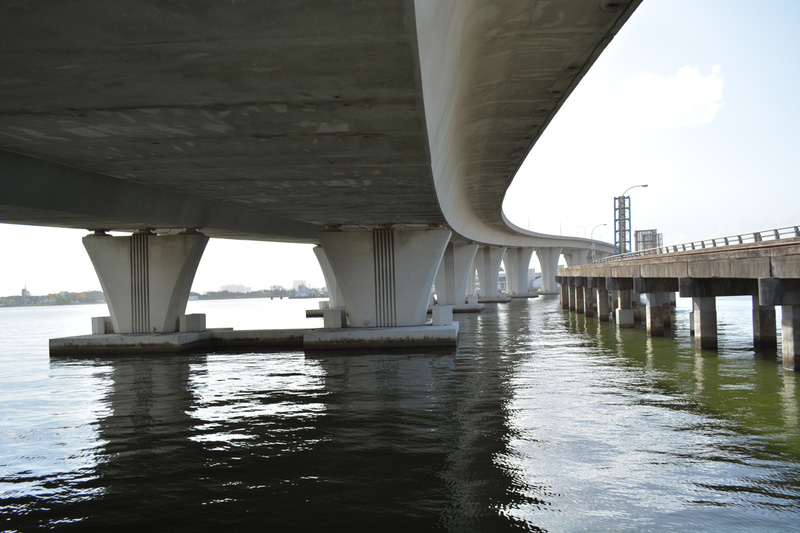 Accommodating six overall lanes, the fixed high-level Port Bridge over Biscayne Bay opened to traffic in 1991. It replaced a two-lane draw bridge, which remains in place just to the south. Photo taken 07/26/17. 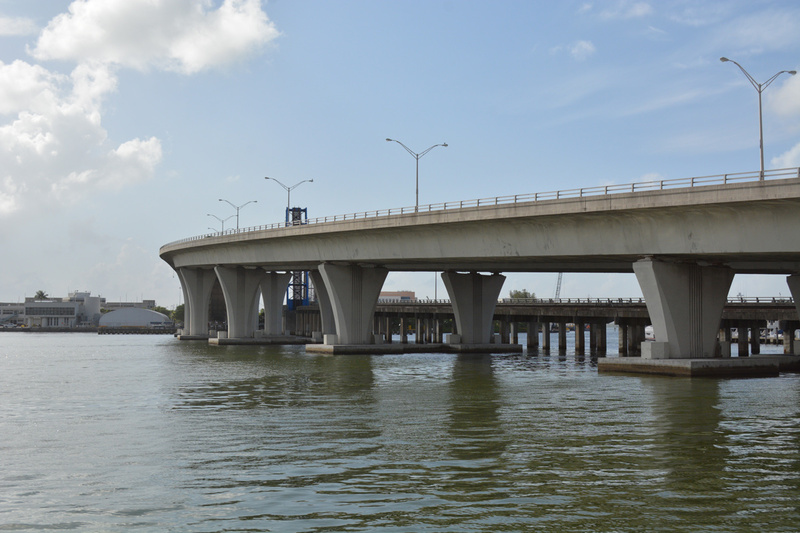 State Road 886 spans the Intracoastal Waterway between U.S. 1 (Biscayne Boulevard) at Downtown Miami and Dodge Island at the Port of Miami. With the August 2014 opening of the PortMiami Tunnel (SR 887), SR 886 (Port Boulevard) provides one of two routes from Port of Miami cargo and cruise terminals. The 0.83-mile long route ties into U.S. 1 at the couplet of NE 5th and 6th Streets between American Airlines Arena and Bayside Marketplace mall. Florida 886 (Port Boulevard) leads east from NE 5th Street and U.S. 1 (Biscayne Boulevard) with three lanes to the Port Bridge. Photo taken 07/26/17. Turn lanes depart from both sides of Port Boulevard for adjacent Bayside Marketplace and American Airlines Arena respectively. Photo taken 07/26/17. Florida 886 spans Biscayne Bay to the turn-off for Caribbean Way and Terminal J in the Port of Miami. Photo taken 07/26/17. The Port Bridge elevates along side the Florida East Coast Railroad to Dodge Island. 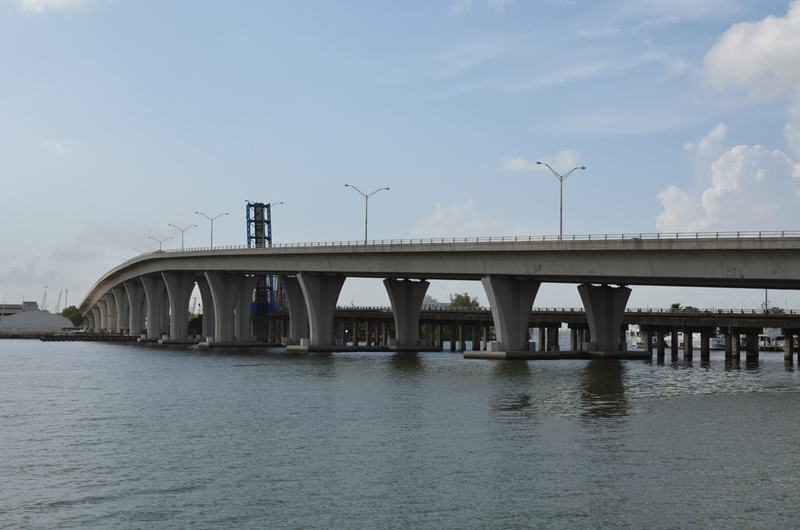 The bascules of the former Port Boulevard bridge remain in place permanently in the open position adjacent to Florida 886. Photo taken 07/26/17. Port Boulevard exits the cargo facilities of the Port of Miami and quickly separates into ramps for Florida 887 (PortMiami Tunnel) and Florida 886 (Port Boulevard) west to Downtown Miami. Photo taken 04/04/15. The PortMiami Tunnel provides a direct link to Florida A1A (MacArthur Causeway) west to Interstate 395 and the Midtown Interchange with I-95 and Florida 836 (Dolphin Expressway). Due to the tunnel dimensions, trucks exceeding 15 feet in height must remain along Port Boulevard to the Port Bridge. Photo taken 04/04/15. Florida 887 descends through the 4,200 foot long PortMiami Tunnel to emerge on Watson Island and the MacArthur Causeway bridge across the Intracoastal Waterway. Photo taken 04/04/15. The PortMiami Tunnel opened to traffic on August 3, 2014. Photo taken 04/04/15. Florida 886 west lowers from the Port Bridge into the north side of Downtown Miami. Photo taken 07/26/17. The impressive array of high rises extend southward along Biscayne Boulevard from the Port Bridge. Photo taken 07/26/17. Overlooking the back side of American Airlines Arena (home of the Miami Heat NBA franchise). Photo taken 07/26/17. Port Boulevard intersects U.S. 1 (Biscayne Boulevard) with three westbound lanes. U.S. 1 parallels Biscayne Bay south into the financial district and north to the Omni, Edgewater and Bay Point communities. Photo taken 07/26/17. One of several signs posted statewide celebrating the 500 year anniversary of Florida appears just west of the Port Bridge. The assembly welcomes tourists visiting the state from the Port of Miami cruise terminals. Photo taken 07/26/17. Prior to the completion of the PortMiami Tunnel (SR 887), all traffic headed to I-95 or the Dolphin Expressway west to Miami International Airport (MIA) was directed onto NE 6th Street west to NE 1st Avenue north for the on-ramp to Interstate 395. Photo taken 07/26/17. The Florida East Coast Railroad crosses Florida 886 Port Boulevard) at grade by the south entrance road to American Airlines Arena. Photo taken 07/26/17. There is no direct access from the PortMiami Tunnel onto MacArthur Causeway (SR A1A) east to Miami Beach. Instead motorists must use SR 886 (Port Boulevard) west and U.S. 1 (Biscayne Boulevard) north to make the connection. Photo taken 07/26/17. Florida 886 ends at U.S. 1 (Biscayne Boulevard). Interstate 395 parallels six blocks to the north as it leads west from MacArthur Causeway to the Midtown Interchange with I-95 and the tolled Dolphin Expressway. Photo taken 07/26/17. Replaced guide signs at the western terminus of Florida 886 (Port Boulevard). Photos taken 05/07/06.